A lot has changed since we started occupying Wall Street 24 days ago. fourth visit not to make speeches, but to see how things are evolving. evolved to bring these “stories from the heart of the park” to a wider audience. ANYTHING that would get us closer to preparing for September 17th. sharing food. We were beginning to build a community. Building community at #OccupyWallStreet is hard, esp. when facing constant eviction threats. Now we know how so many Americans feel. On the one-week anniversary of Liberty Plaza I watched the heart of the park galvanize before me. After the police attacked and pepper-sprayed protesters at Union Square and followed us down to our home at Liberty Plaza, we all prepared for a showdown. Paddy-wagons lined the streets. Hundreds of police officers lined the perimeter of the park, their hands poised on guns, orange nets, and reams of zip-ties that hurt my wrists just to look at. We gathered for a General Assembly (GA), as we do every evening, in a unified, determined group under an intense cloud of imminent danger, and asserted that we were not afraid. We developed contingency plans for when the police swept the square. People lined the park with candles, creating a buffer-zone between the police and our central organ, the GA. Drums and brass instruments filled the air with an upbeat yet unavoidably ominous tone I somehow imagined accompanying the Titanic’s final hours. 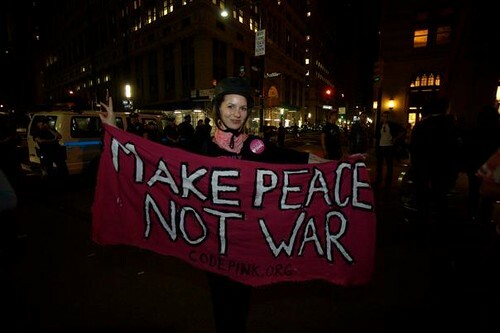 Older activists from CODEPINK and the anti-war community checked in or came by to see what was happening – asking, but not telling, what we were going to do. “We’re staying,” I told them. Some lingered on the outskirts like guardian angels, patiently, silently watching. “We’ve got your back.” The Occupy Wall Street bike bloc slowly circled the square in solidarity. “We are watching. We are with you.” I armed myself with a hot pink “Make Solidarity Not War” sign to go with the “Make Bikes Not War” signs adorning my bike and joined them to burn off nervous energy. conversation about what we were doing while in line for the bathroom at McDonalds and when he came out, the stranger he had been speaking with gave him a burger and fries. Slowly, as the night progressed, something incredible happened. The police started to pack up and leave. The bike bloc continued to circle until we were sure our home was safe, and then did a final victory lap, bells ringing, lights flashing, flags waving. The community had survived. The heart of the park beat stronger than ever – and we were all part of it. (NE corner of Zuccotti Park) to participate in this ongoing story-sharing experience.